The best way to calculate area is to measure everything in blocks. Blocks can be squares or rectangles. You may have multiple blocks in one room. 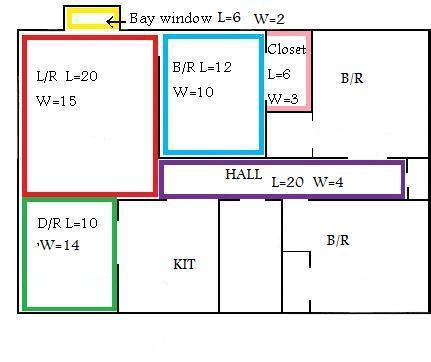 (example: some rooms have offsets, where the walls may jog in or out or closets that may be in bedrooms or hallways). After you determine where your blocks are in each room, measure each individual block. Multiply the length by the width LxW to get the square footage of each block. Write the size down of each block. Then double check each one to make sure you do not forget any areas. You want to avoid any extra expense as in being short of material and having to pay a freight charge when you order more. In the diagram below the living room may measure 14 feet 8 inches by 19 feet 9 inches. Round these figures up to 15 X 20 which comes to 300 square feet, do this to calculate area needed. I outlined each area in a different color where we will install new flooring. Next I measured each room (block), length by the width. Now this 670 sq/ft is the actual amount of this area. When you purchase your flooring You will need to add from 5% to 10% to the 670 sq/ft. This extra flooring that you order is for waste, mistakes, damaged product and for you to have extra flooring left over just in case you need to repair your floor in the future. 10% of 670 will be 67sq/ft add this to the 670 and the total amount you will order will be 737 sq/ft. You will round this off to the nearest amount in order to get all unopened boxes. The amount of extra flooring you order can vary depending on the room or rooms you are doing. One square room may not need as much extra as doing your entire home. No one wants to come up short on material so to be safe you could order 10% or even more when you calculate area needed. You can do this if the store you purchase from will allow you to bring back unopened boxes for credit. After the purchase of your laminate and before receiving it, you need to check for any damage that may have occurred during shipping or handling. This can happen easily from not being properly secured during shipping or somebody not paying attention when handling. If the corner of a box is banged up against something it can chip that corner on every piece in the box. Especially if the product is not a very good quality. If you have too many of these you will come up short on flooring. Laminate flooring needs to be acclimated before it is installed. This helps to minimize the amount of expansion after the floor is installed. After purchasing your laminate stack it in your home for 48 hours so it can adjust to the climate of your home. Think about where your going to start laying the floor, and stack it on the opposite side so you don't have to move it twice. Most of the underlayments today have a moisture barrier built in, so you don't need to purchase a separate moisture barrier. If the laminate you are going to purchase has the underlayment attached and you are installing the laminate on a concrete floor, you will have to purchase an additional moisture barrier. (concrete floors can contain moisture) The moisture barrier usually comes in 10 x 10 or 12 x 10 sheets. When I calculate area needed for the flooring I order the same amount of underlayment as I order flooring. If the floor you are installing the laminate on is raised up off the ground, you should not need a moisture barrier, unless there is excess moisture underneath. After determining the amount of flooring and undrelayment needed lets move on to the next step, measuring transition molds.